Our group investigates structural, electronic, magnetic, vibrational, and chemical properties of size- and shape-selected nanostructures. These fundamental physical properties are of great importance to many applications of nanotechnology, including giant magnetoresistance spin valves, magnetic tunnel junctions, single electron transistors, molecular electronic devices, thermoelectric devices, and catalytic systems for energy generation and environmental remediation. Emphasis is given to: (i) synthesizing metallic nanostructures with well defined geometries, (ii) understanding the mechanisms underlying the enhanced chemical reactivity of metal nanoclusters, (iii) monitoring size- and composition-dependent changes in the electronic structure and vibrational dynamics of nanoscale systems, (iv) investigating themagnetic properties of nearly 1D and 0D systems, (v) exploring chemically- and thermally-induced changes in the mobility and morphology of nanostructures. Despite more than a decade of intense research on nanoparticle catalysis, fundamental knowledge of key features that influence the catalyst activity and selectivity of a chemical reaction is still lacking. This project aims to improve the understanding of the processes taking place in nanocluster-catalyzed reactions by systematically studying how the nanoparticle size, shape and composition affect its chemical reactivity. We use the low temperature carbon monoxide oxidation and the direct propylene epoxidation reactions on metal-oxide-supported gold nanoparticles as a model system. To create ordered arrays of size- and shape-selected nanospheres, nanorods, and triangular nanoprism catalysts we use different ex-situ wet chemistry methods such as nanosphere lithography and the self-assembly of metal loaded block-copolymer micelles. 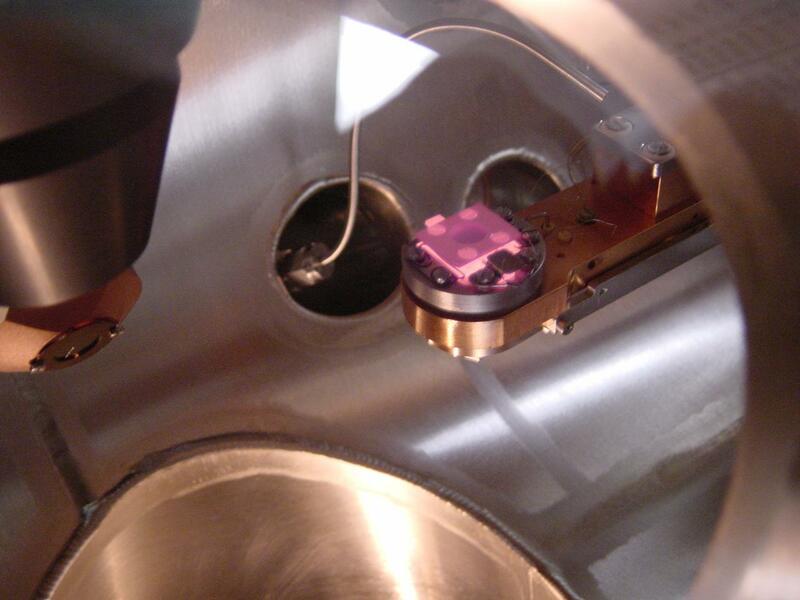 In addition, in-situ nanoparticle shape modifications by pulsed laser irradiation are being conducted. Interconnections between directly measurable electronic phenomena and surface chemistry are being used to provide insight into catalytic reactions. 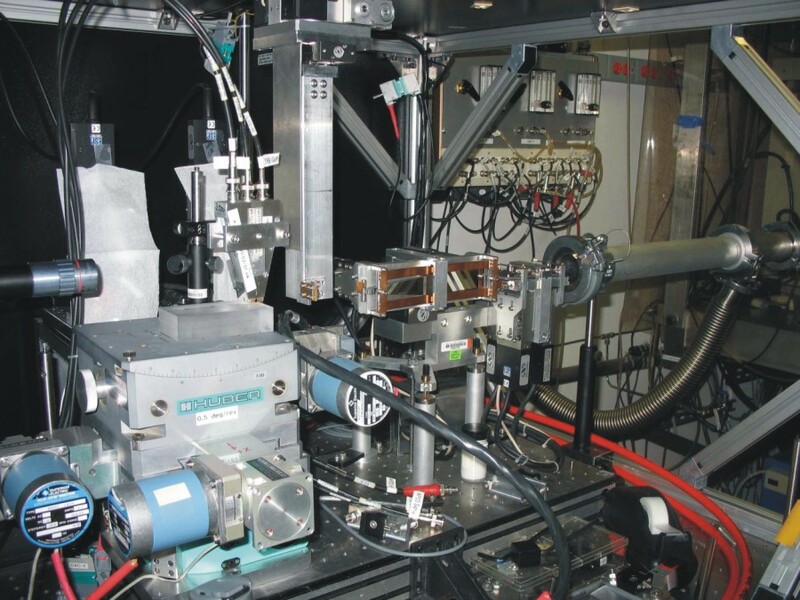 Temperature-Programmed Desorption (TPD), Scanning Tunneling Microscopy (STM), X-ray Photoelectron Spectroscopy (XPS) and Ultraviolet Photoelectron Spectroscopy (UPS) are being employed to characterize the changes induced in the metal nanoclusters and their supports upon gas exposure and ultraviolet monochromatic light irradiation. The proposed research may lead to the discovery of new catalytic processes while making efficient use of energy and raw materials with minimal influence on the environment. A profound knowledge of the atomic vibrational properties of nanostructured materials is of great fundamental and technological importance since the vibrational properties, in particular the vibrational density of states, VDOS, are the key to an understanding of thermodynamic properties like heat capacity, vibrational entropy, mean sound velocity, Debye temperature, and thermal conductivity, as well as electron-phonon coupling and 1/f noise of electronic devices. Moreover, phonon-assisted chemical reactions might play an important role in some catalytic properties of nanoclusters. Our group regularly visits the Advanced Photon Source at Argonne National Laboratory, where we use synchrotron-based Nuclear Resonant Inelastic X-Ray Scattering (NRIXS) techniques to investigate the vibrational properties of nanoscale metallic multilayers and size-selected supported mono- and bimetallic 57Fe nanoclusters. 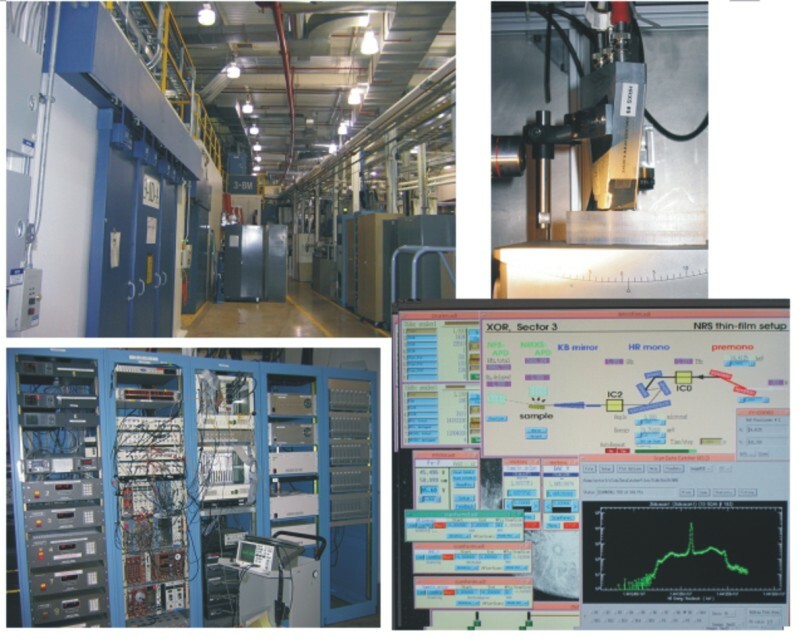 NRIXS setup, 3ID beamline, Advanced Photon Source, Argonne National Laboratory (Chicago, IL). VDOS [g(E)] of 57Fe nanoclusters coated by Fe2O3 (samples #1, #2), and Fe3C (sample #2b) shells obtained by NRIXS. For reference, the VDOS of bulk bcc-Fe is also shown. Insert: low energy part of g(E). Magnetic nanoscaled heterostructures have a number of applications as recording media, magnetoresistive sensors, read heads and magnetic random access memory. Thin films magnetized perpendicularly to the film surface are currently being used as magnetic recording media. Such systems enable a substantial increase in the density of information that can be stored on a hard disk, by using smaller magnetic domains or bit sizes. This is a necessary condition to fulfill the current demand of more storage capacity. 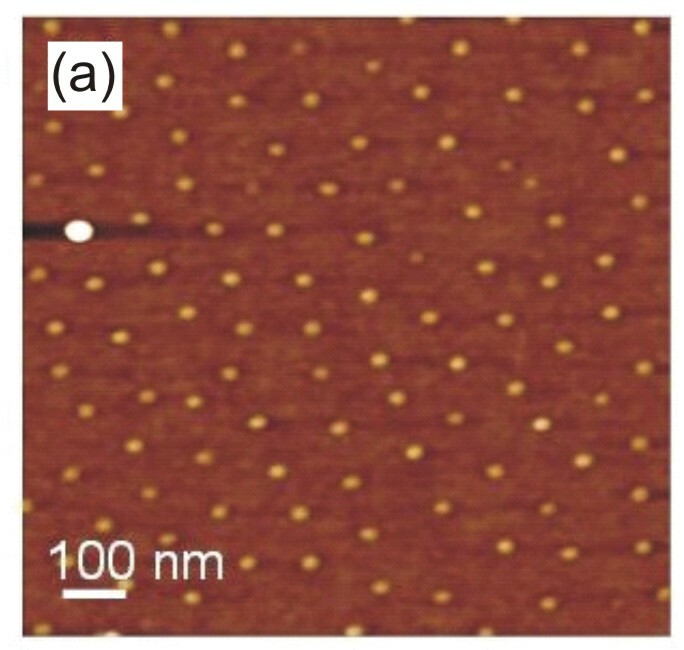 Our recent work studied the relation between magnetism and atomic nearest neighbor distance in nanoscale heterostructures such as epitaxial ultrathin Fe films on Cu3Au(001), nearly one-dimensional (1D) Fe stripes on Pd(110), and nanoclustered Fe films on GaAs(001). 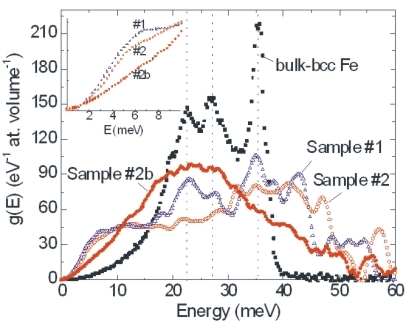 The existence of magneto-volume instabilities (low-moment/high moment transition) in metastable fcc-like Fe thin films can produce dramatic changes in the Fe atomic magnetic moment as well as in the magnetic structure or exchange coupling. Additionally, reduced dimensions and the presence of interfaces can alter magnetic properties of these systems such as magnetic anisotropy or domain formation, and can lead to ferromagnetic to superparamagnetic transitions. In our group, these properties are being studied by means of Mossbauer Spectroscopy and Magneto-Optic Kerr Effect. Ph. D. student Farzad Behafarid (Professor Roldán) has won the First Prize (and $1000) at a prestigious International competition of the American Vacuum Society held this year in New Mexico. The Prize is from the Nanometer-scale Science and Technology Division of the AVS. Farzad presented a poster and gave a talk for the award competition. Professor Beatriz Roldán received a position as associate editor of the Journal of Vacuum Science and Technology B. She was also the recipient of the Peter Mark Memorial Award from the American Vacuum Society.